The camera loves nothing the way it loves the desert. The sun across an uninterrupted sky; sand or clay swallowing up the light the same way it swallowed up the water. A desert suggests a story before anything enters the frame. 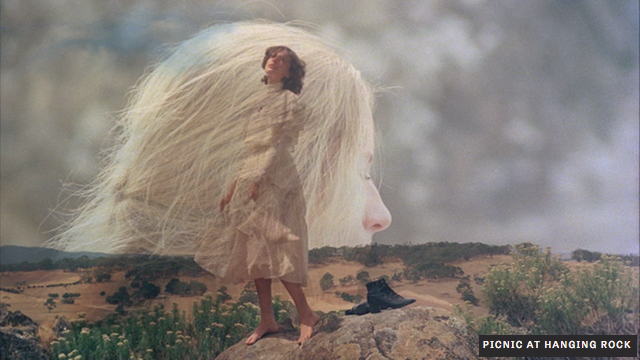 It’s a landscape of the psyche that presents an essential cinematic image: absence. Wilderness is beautiful everywhere, and suggests high-stakes stories whenever the camera finds it—the sea has the infinite starkness of the desert (and is only slightly less lovely to photograph), and the forest evokes shadowy unknowns. But stories about the desert aren’t just stories about wilderness. Desert stories are about the inevitable. Only the specifics change: what sort of desert is approached, and what sort of inevitability is to be faced. It’s what separates desert stories from Westerns, in spite of their shared narrative and visual markers. Westerns are about struggle. Desert stories are about the doomed. George Miller’s Mad Max: Fury Road has been praised for nearly every aspect of its filmmaking—the relentless pacing, the gleeful diegetic soundtrack, the stunning, two-hour portable battlefield. But two things are most frequently lauded. One is its de facto feminism, since Charlize Theron’s Imperator Furiosa drives the narrative (and the war rig) by taking a warlord’s five wives to the safety of matriarchal bikers before returning en masse to take over the city. The other is the desert itself, shot by John Seale. It’s a world split into blue and gold, sand that’s both bedrock and traitor, blood-edged dust storms and nights saturated with silent-film cobalt. These aspects seem disparate at first glance, but they actually draw along a particular vector. 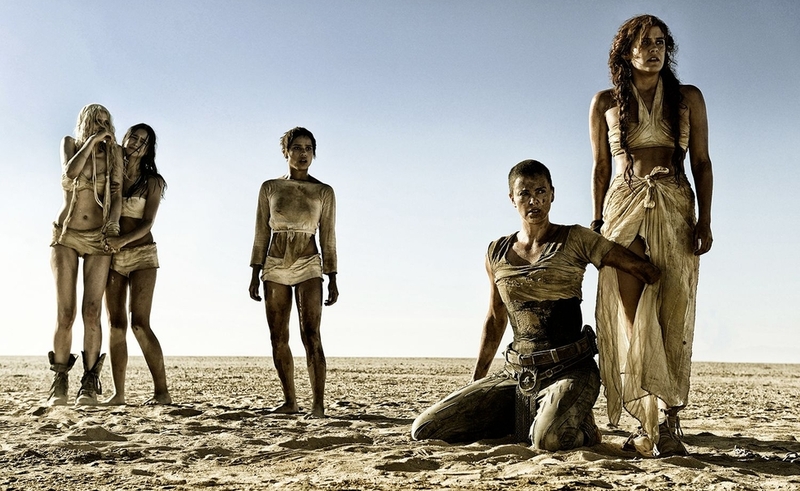 Mad Max’s women are part of the tradition of the feminine desert, rather than the masculine. The masculine desert is a familiar one, a place of conflict and self-examination, and its pedigree is easy to trace. This is the desert that seduced Lawrence of Arabia, who—after sating his “great hunger for desolate places”—begins to question his loyalties, his victories, and his identity. David Lean’s direction and Freddie Young’s cinematography in 1962’s Lawrence Of Arabia present a desert merciless in its honesty, filmed with an unmatched sense of depth. (It might be the closest a film desert has gotten to seeming infinite.) In one stunning image of Lawrence’s early days, Lawrence and his guide watch Sherif Ali approach on camelback across the emptiness, unsure whether he’s a friend or a foe. Neither party can conceal themselves, which is at best uneasy comfort: That inevitable desert presents them with an outcome, and all they can do is try to outguess it. Lawrence fights against it, of course—whether amid the people he galvanizes, or with his face swamping the sky, his shadow marching along as if trying to cover as much sand as he can. His struggle is to leave a mark on a desert that refuses him. 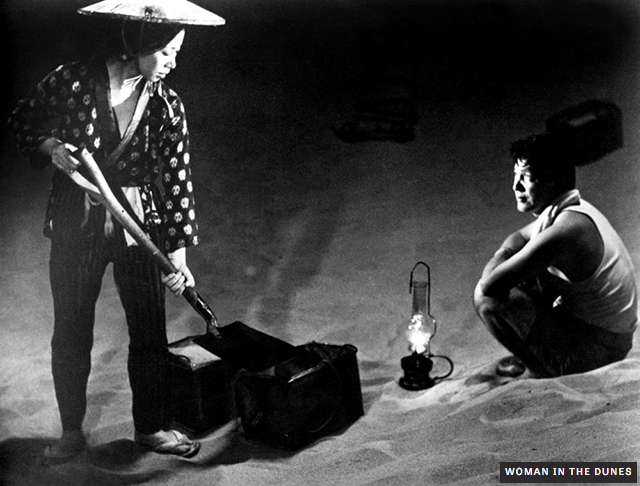 It’s a struggle echoed neatly in 1964’s Woman In The Dunes, a Sisyphean fable of painstaking realism. Director Hiroshi Teshigahara and cinematographer Hiroshi Segawa captured some of the most beautiful desert ever filmed—dunes roiling like waves, sand scattered across the human body until skin becomes a horizon writ small. It’s also a masculine desert. Its emotional concerns are tied to Junpei, the outsider unwillingly assigned the mythic task of digging sand with the widow of the title in order to prevent the burial of her house, located at the bottom of a quarry. The desert is an embodiment of struggle, with the widow as inscrutable as the sand that imprisons them. And though Junpei struggles with accepting both (and makes a nearly fatal escape attempt), the desert eventually—inevitably—conquers. He decides to stay there and dig a life for himself, and the sick widow is brought up out of captivity and vanishes into the sand. This last is particularly interesting in light of the masculine desert set against the feminine. The masculine desert is a place of struggle. Its inevitability is a reminder of mortality. The feminine desert is a different anima. In film, the relationship between a woman and the wasteland is often some inexplicable symbiosis, tinged with the speculative even if the film otherwise isn’t. In a masculine desert, part of a man’s struggle is against the environment; in a feminine desert, her struggles are elsewhere and the environment merely hosts them. (The widow of the dunes accepts the sand wholeheartedly—as her profession, as her prison, on her body.) Perhaps, given cinema’s long history of admiring women and fatal spaces with the same morbid fascination, it shouldn’t be a surprise that when a woman is in the desert, the camera sees two equally unknowable things. In a feminine desert, women share a rapport with the surroundings that takes on a sense of the surreal, of the Other—a greater communion carrying greater mystery. So the widow of the dunes doesn’t die; she’s lifted into the greater desert. The landscape is merely taking her back. This particular inevitability is familiar in the feminine desert. In “Pumzi,” a 2009 short film from Kenyan director Wanuri Kahiu, ecologist Asha flees to the post-World War III wasteland with the last living seedling. (It’s a motif repeated in Fury Road, as the Vuvalini matriarch shows her homemade seed bank to young Dag, who’s pregnant—a fertility both women wordlessly understand means the seeds should fall to her care.) Asha’s trek to plant the seedling pares the desert narrative to the basics, as cinematographer Grant Appleton frames her like a piece of driftwood, staggering in contrapposto against a desert so mythic, it seems made of watercolors and breath. The tree Asha hallucinates is only a stump when she reaches it, and as she gives her last sweat to nourish the seedling and shades it with her corpse, she does it in the graveyard of the tree that came before. But the final moments of “Pumzi” suggest that tree wasn’t a mirage, but a vision: her seedling grows into that full shade tree, as the camera pans onward to a forest that swallows the desert with green. What became of the girls is the immediate concern of the rest of the film; unsurprisingly, the hunt to conquer this desert is led by men, but it’s the women whose lives fall apart after this evidence that the desert offers an escape, even if it does swallow its discoverers. (Their driver cuts to the news: “The strength of it is this: Three of your young ladies and Miss McCraw are missing on the rock.” There’s truth behind that phrasing—there’s power in their disappearance.) It’s a mystery doomed to be unsolved, since the covenant between the girls and the desert goes too deep to explain. Even when one of the girls, Irma, is discovered alive and seemingly unhurt, she refuses to discuss what happened in the desert. The men believe she’s lost her memory; the girls at the school know better. The closest the film’s smothering tension comes to snapping is a farewell visit that becomes a gauntlet of shrieks, as the girls demand to know where the others went; it’s a desperate plea as much as a communal fear. (The dreamy, silent accord of the ones who walked into the desert and vanished stands in stark relief against it all.) But the Rock keeps its own secrets, and those who have communed with it fold into it and disappear—not for anything so prosaic as death, but something less explicable, a scrap of lace left behind like some ephemeral goodbye. The feminine desert isn’t an absolute. There are films that fit the pattern while using the speculative as a mere grace note. In Priscilla, Queen Of The Desert, the climactic performance features bottle-brushes, ostriches, and frilled lizards—sigils of some liminal desert the protagonists have brought with them from their journey, and conjure from nowhere mid-performance, for another surreal touch. But their desert a recognizably different tool—both aesthetic and narrative—from the masculine one, and weights their story accordingly. And the Mad Max franchise swings comfortably between genres: The original was a noirish cop drama against an encroaching apocalypse; The Road Warrior was a desert story; Beyond Thunderdome carried Western trappings; and Fury Road returns to the shape of The Road Warrior, as if trying to redistribute the outcome. Much of Fury Road’s action visuals rest heavily on the masculine desert and what can be done to conquer it: spiky scavengers, souped-up war buggies, and rock bikes try to turn the desert into a road. But the feminine desert is something else; there’s a spark of that secret impossible in Furiosa, who straddles both worlds, and whose driving seems supernaturally assisted. The sandstorm appears as if summoned; the camera itself treats its sudden, impossible scope as a reveal, pulling back after Rictus’ exclamation, and seeing what the desert abruptly made for a woman who needs it. When the first Vuvalinas come out to meet the war rig crew, their motorcycles rise out of the sand nearly in plain sight, as if they’re made from it. And though for the War Boys, violent death ensues if the front of their cars ever hit the sand, when the war rig’s engines are set alight, Furiosa lowers the vehicle’s grill, and the desert blooms up to put out the fire as if waking to save a friend. With so many metaphors and so many landscapes possible, there’s no definitive cinematic desert—there’s only a family tree of influences, in which metaphors can be put to work. Fury Road’s plot is nothing special. (It is, in effect, a gloriously kinetic U-turn.) Its narrative interest stems from the shift it brings to the context of the desert itself, from Max’s masculine to Furiosa’s feminine. That change in perspective layers visual tension into a film that knows just what to do with it. The men of Mad Max: Fury Road seek victory and their identities in the masculine desert. The women have no such trouble. Their struggles lie elsewhere. And the desert understands them, even if it claims them: The feminine desert’s power works in stranger ways.